This was an ancient manor, granted by Alfred the Great’s daughter Elfrida to the Abbey of St Peter at Ghent. It was Lievesham at that time, and probably began as the homestead of a man called Lēof or Lēofsa. Around half a dozen mills were operating on the river at the time of Domesday Book. These were later used for grinding steel as well as corn, and for weaving silk and tanning leather. St Mary’s vicarage dates from 1692–3 and the church was rebuilt in 1774–7, with the base of the tower remaining from the medieval structure. It now forms the focus of Lewisham council’s St Mary’s conser­vation area. In the 18th century Lewisham’s ‘healthy air’ encouraged a growing number of merchants to build resid­ences here. However, like most south London districts except those on the bank of the Thames, its rapid growth did not begin until after the arrival of the railway. The South Eastern Railway’s North Kent line came to Lewisham in 1849 and the Mid Kent line branched off from it here in 1857, when the present station was built. Until the 1870s developers built substantial houses for the upper middle classes, accom­panied by a sprinkling of cheaper housing for those who provided their services. Thereafter, the wealthy began to leave and streets of more densely packed housing were laid out for clerks and artisans. Housing and civic amenities spilled across the Ravensbourne into neigh­bouring Ladywell. Many of the earliest properties had already been demol­ished and replaced by the end of the 19th century. 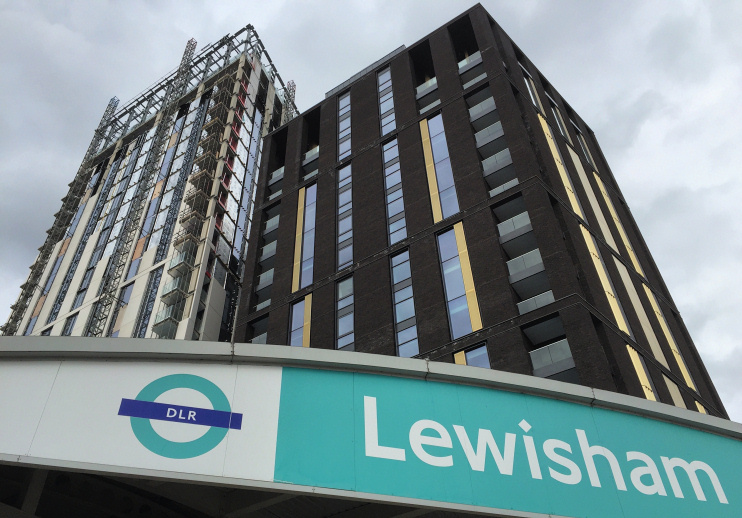 With its growth as a transport hub – served by two railway lines, trams and buses – Lewisham grew in importance as a shopping centre. The two largest businesses were both drapers’ stores: Chiesman’s and George Stroud. The town honoured Queen Victoria’s diamond jubilee by erecting a clock tower, and a street market began in 1906. St Saviour’s Catholic church was built on the High Street in 1909, though its landmark campanile (shown in the photo*) was not completed until 20 years later. Stroud’s was rebuilt in 1933 as Tower House, the flagship store of the Royal Arsenal Co-operative Society. Much of the town centre had to be rebuilt following bomb damage in the Second World War, while municipal estates were laid out on the outskirts. The London County Council’s Orchard estate (now the respons­ib­ility of the Royal Borough of Greenwich), begun in 1963, was one of the largest. By that time Lewisham was becoming a multi-ethnic community, the largest minority (then and now) being of black Caribbean origin. The Riverdale shopping centre was built in 1977, at the paltry cost of £13 million. It is now simply called Lewisham shopping centre. Chiesman’s department store became an Army and Navy Store in 1983 and has since been replaced by a police station. Following the demise of the Royal Arsenal Co-op in 1985, Tower House succumbed to a succession of second-rate commercial uses before its upper floors were converted into the Tower Loft Apartments in 2016. Urban regen­er­ation in recent years has been focused on the vicinity of the station. Though most of ‘Lewisham Gateway’ consists of private apartment blocks, one community benefit has been the construction of the Glass Mill leisure centre, which opened in 2013 on Loampit Vale. Assuming everything goes to plan, work on an extension of the Bakerloo line to Lewisham – via Old Kent Road and New Cross Gate – could commence c.2023 and is expected to be completed by 2029. The line could after­wards be extended as far south as Hayes, replacing existing National Rail lines. The musicians Ginger Baker, Maxi Priest, Matt and Luke Goss and Natasha Bedingfield all grew up in Lewisham. * The picture of Lewisham DLR and development at the top of this page is slightly modified from an original photograph, copyright Matt Brown, at Flickr, made available under the Attribution 2.0 Generic licence. The picture of St Saviour’s church tower is modified from an original photograph, copyright Eric Lyus, at Geograph Britain and Ireland, made available under the Attribution-ShareAlike 2.0 Generic Licence. Any subsequent reuse is freely permitted under the terms of those licences.